SAN DIEGO, Calif. (CBS 8) - The Red Cross is helping three people after their home in Rancho Penasquitos was damaged in a fire Monday. Firefighters were called to the 12000 block of Amaranth Street just before 2 p.m. Monday. A couple and their teenage son were not home at the time. Firefighters say the fire started in the garage. 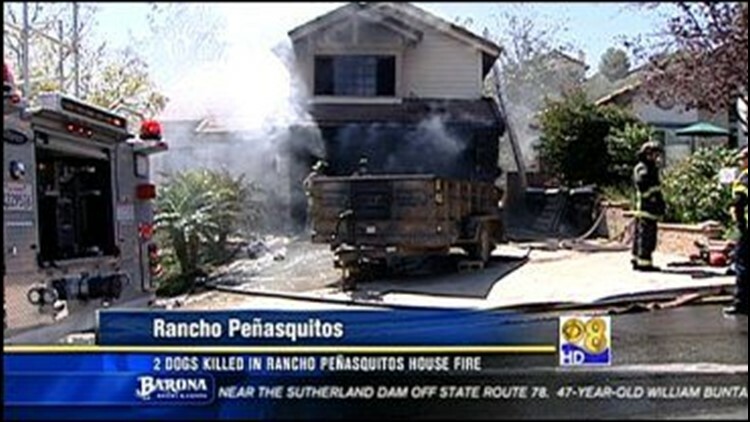 As they searched the house, they found two dogs in a bedroom. "[The dogs] were gone, smoke inhalation, you know, and their tiny little bodies and their tiny little lungs," Robyn Benincasa of the San Diego Fire-Rescue Department said. "Obviously all the smoke rises so you know they were in the worst possible place and they were in it for quite awhile." Firefighters gave the dogs CPR, but they didn't make it.